When looking at preschool tables, the most important aspects to keep in mind are height, size, surface materials, and the activity for which the table is intended. After that, you can think about the aesthetics, such as shape and color. For preschoolers to kindergarten, you should look for tables that measure from about 19-23 inches in height. Some tables come with adjustable legs, so you can raise and lower them to suit your needs. Generally speaking, children up to kindergarten age sit at least four to a table, and sometimes as many as six or eight. Remember that when you purchase your preschool tables. If you're looking at a rectangular table, calculate approximately 20 inches for each child. For round tables, figure that between eight and ten children can fit around a table that has a 48 inch diameter. Although preschool and kindergarten children are not necessarily hard on their preschool furniture - even their scissors tend to have round edges - they can be pretty messy. Glue, crayons, markers, glitter and paint will all "decorate" your tables liberally. So, although you may not need tables with hard plastic tops, make sure you buy those with a high quality laminate to make clean-up as hassle-free as possible. What will your budding students do at their tables? Most preschool classrooms use what are known as activity tables, which - as their name implies - can be used for a variety of activities by a number of students at a time. If you have corners in your preschool, consider purchasing tables that seat only two or three children to stimulate intimate, interactive play, and to help keep corners for quiet activities - like the book corner - quiet. While wood tables in corners look beautiful, they are quite costly, so you may want to think about multicolored plastic tables instead. The shape of your school tables will depend a great deal on the structure of your preschool classroom. Although the standard tables you see are usually either round or rectangular, school tables come in a wide range of shapes to suit any floor plan. Some schools prefer kidney-shaped tables, as they allow all the children seated around the teacher to have an equally good view. If it is important to you to be able to push tables together for group activities, then consider trapezoidal tables. In addition, Hertz Furniture carries specialty tables that come in unique shapes like cloves and flowers. As far as color, the only limit is your imagination. 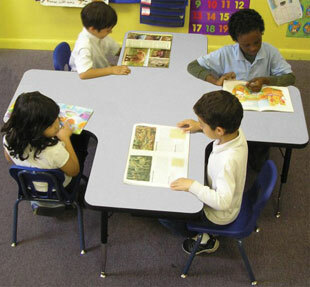 School tables for the preschool classroom come in a large selection of colors and color trims. Just make sure that there is a color scheme, so that you don't end up with a classroom so bursting with color that your students' eyes get dizzy. For a smart looking classroom that is completely color-coordinated without being busy, try the Educational Edge collection. They have tables, bookcases, cubbies, storage cabinets and even teacher's desks that all coordinate together. So you see that when you are choosing preschool furniture, particularly preschool tables, you have many options. If you have any further questions or you'd like assistance in finding preschool tables that will best suit your needs, feel free to contact a Hertz Furniture expert at 888-793-4999 or by chat between 9am-5pm Eastern Standard time.